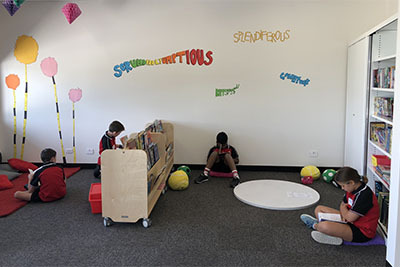 Margaret Hendry School, located in the new suburb of Taylor in Gungahlin’s north, officially opened its doors for the first time on Monday. 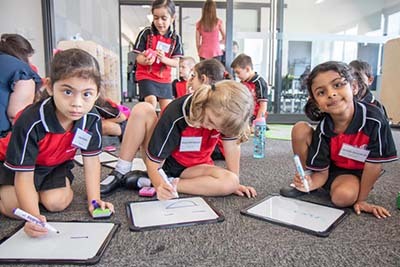 While other schools across the ACT welcomed only new students to kindergarten, Margaret Hendry School settled in all new students from preschool to year 6. 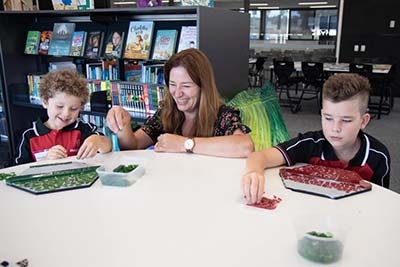 Minister for Education and Early Childhood Development Yvette Berry, Director-General Natalie Howson and other Education Directorate staff visited the school on day one to witness the staff and students making themselves at home. Principal Kate Woods said it had been an exciting morning for everyone. “It’s something we’ve been planning and thinking about for a really long time,” Principal Woods said. Minister Berry joined students to help them create a mosaic for the front office depicting the schools four pillars for learning - Grow, Collaborate, Connect, Love. Students showed off their new facilities, which feature innovative learning environments centred around open areas and outdoor spaces. The school also has a range of purpose-built facilities for music and physical education, as well as Science, Technology, Engineering, Arts and Mathematics (STEAM). This modern school facility is the 88th public school in the ACT and will cater for 176 preschool and 600 primary students. For more information, head to the Margaret Hendry School website.